Have you ever wondered how those delicious pickled cucumbers or vegies were made when you grew up? I certainly did. 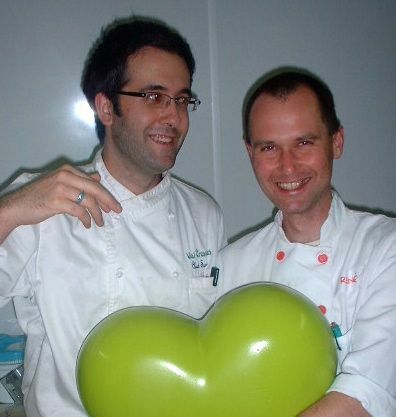 If you happen to ask any chef about pickles, they will highly likely start talking about vinegar, sugar etc. 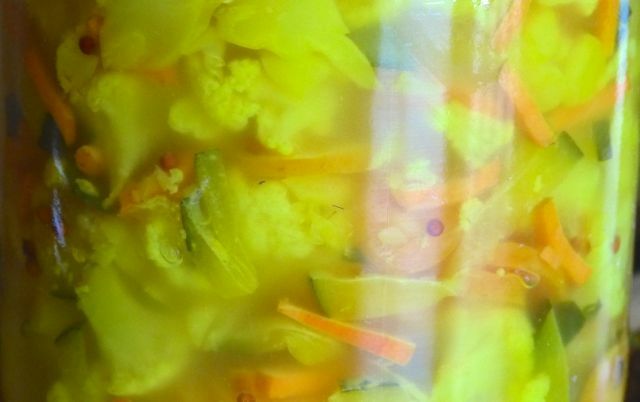 The art of preserving and enhancing vegetables with a salt brine, creating a lactic fermentation process is almost forgotten. 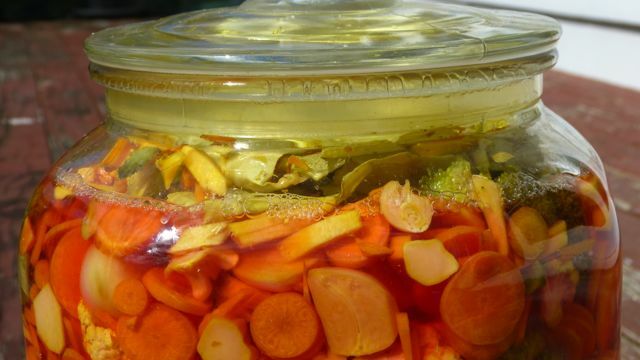 Thank Heavens and himself for Sandor Ellix Katz’ book: ‘Wild Fermentation’!!! It reconnected me with more than one traditional way of preserving and enhancing food. Will make enough to fill a 4.5l jar/crock pot. ½ t Grape tannin powder (home brewing supply shops). Or a handful fresh grape-, cherry-, oak-, and/or horseradish leaves (if available). Chop cauliflower into small florets. Peel the stems and dice. Using a mandolin, grate/cut Turmeric into small matchsticks. In a large bowl mix all the vegetables, turmeric and garlic. Keep a few cloves of garlic aside to put on top of the finished crock. Keep cabbage leaves aside. Dissolve the sea salt (6T/90ml) in 2 liters of water to create a brine solution. Stir until salt is thoroughly dissolved. Clean the crock, then place at the bottom of it some of the mustard seeds, fresh grape leaves and a pinch of black peppercorns. Place the mixed vegetables in the crock. Disperse some more of the black mustard seeds, bay leaves and black pepper throughout. Finish with the remaining garlic cloves on the top. Pour brine over the vegetables. Fill the jar/crock almost to the top. Put folded cabbage leaves on the very top of the mix and press down. The cabbage leaves should be partially covered by the brine. Now put lid in place and close the crock/jar. If the crock pot does not have a tight fitting lid or you are using a traditional Sauerkraut crock pot, place a clean plate over the vegetables then weigh it down with a jug filled with water or a boiled rock. If the brine doesn’t cover the weighed-down plate, add more brine mixed at the same ratio of just under 1 T sea salt to each cup of water. 10. Enjoy the pickles as they continue to ferment. Continue to check the crock/jar every day. 11. Eventually, after one to four weeks (depending on the temperature), the pickles will be fully sour. Continue to enjoy them, moving them to the fridge to slow down fermentation. The same recipe works to create different colours, e.g. with zucchini (add tannin to keep crisp!!! ), beetroot, carrots and garlic. This will be a deep purple pickle! Experiment with greens too! Silver beet pickles beautifully! Feel free to play with other spices too! Ginger, coriander seeds, juniper berries etc. I find it not necessary to weigh down the top of the pickles etc.. 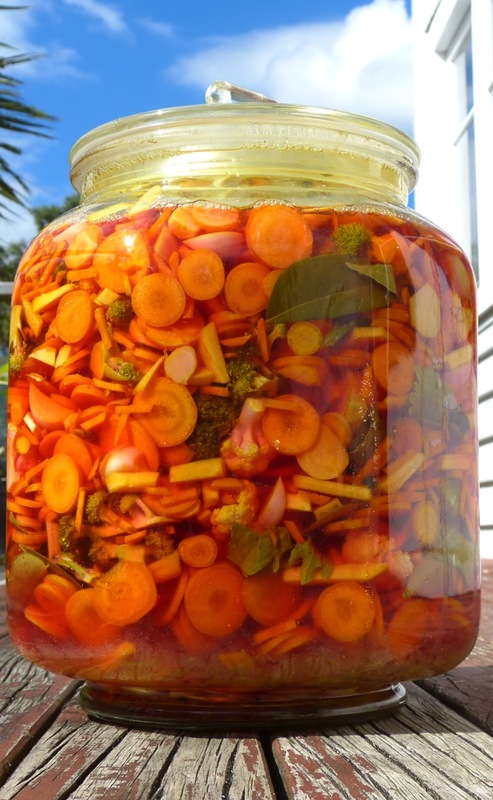 It is usually fine to fill the jar to the top with vegies and brine and then just seal the lid, put the jar into a bowl to ferment – to catch the brine that gets squeezed out during fermentation. For metal lids I use a double sheet of cling film over the top of the jar before putting on the lid. That prevents the salt brine from corroding the lid. Enjoy your pickles as a side dish, vegetable part of your meal or a yummy snack between meals! PS: Yes, we’ll make these kind of pickles at the Raw Chef Trainings, Level 1. How to learn a craft? or What does it take to apprentice? Funny title for a food related blog, you might think. I agree, yet it’s not that weird. Why are you here reading this? Right, you want to learn, expand your horizon. You were maybe looking for that ONE recipe out there that finally tells you how to use fresh turmeric. You are willing to go out of your way for new knowledge that will improve the quality of your life. That’s however not the kind of learning I mean with ‘apprenticing’ or ‘apprenticeship’. These days online courses, webinars and home study courses are all the hype. In my arrogant opinion: because they are easy to market and have a low commitment level from the student (both in terms of financial- and time- investment as well as showing up to the actual course). Usually in the end, your online education provider will send you a certificate that you can display on your website or hand you a few e-book files that you are now allowed to sell with your name on. It has, however, NOTHING to do with learning a craft. Have you ever started a new sports discipline? How long did it take you to stand up on that surfboard, ride that horse/bicycle/motorbike…? It took me 5 years in bicycle racing (started at age 10), 3 years in whitewater kayaking and 4 years on motorbikes to attain a level of unconscious competency. Same in my professional life: first mechanical engineering, then raw food chefing and teaching, network marketing, now traditional nutrient-dense foods. Coaching next. Practice, practice, practice – no shortcuts here. Teach others while you learn. It develops your own mastery. Unconscious Incompetence. We don’t know that we don’t know and go on an ill-prepared kayak trip into a cyclone weather front. Conscious Competence. We learn study and practice and now know that we know. We have the right gear, are practicing our paddling and rescue skills and are gaining confidence. Unconscious Competence. We don’t even know that we know. Our subconscious mind has taken over. Think of driving your car now vs. when you first started driving! In my experience, from teaching hundreds of people in sports as well as the culinary field, many of us operate in the first category: Unconscious Incompetence. 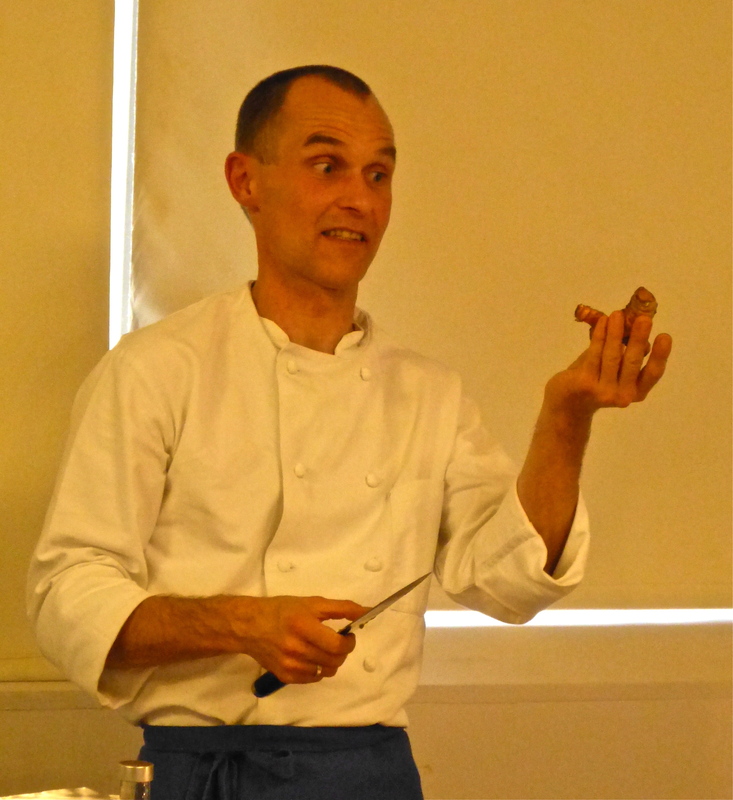 We think we like something, attend a seminar, webinar, food demo and usually get some great entertainment out of it. Once back home we might give it a shot to do what we saw the lecturer do. Now HERE is the chance for real learning! If we DON’T succeed, we might throw the towel in and call it ‘too hard‘, OR we get intrigued and switch into Conscious Incompetence with a keenness to learn and to find out how. Trust me, until you are actually doing it yourself, you won’t! For me this is usually the stage when I engage with a Master in my field of interest – by default when apprenticing as a machine builder in 1985 at the BWF in East Berlin; with Master Chef Chad Sarno in 2003 and lately with Sally Anderson. Now what’s required at this point? – you might ask. First of all an empty glass. You might have heard the Bruce Lee story and how he prepared his students to teach his excellence in martial arts. Stop reading until you have watched this video below with John Kanary at least twice! Have you ever had a small school kid lecturing you with incorrect facts about something you had attained mastery in? Funny isn’t it?! Yet a waste of your time trying to re-educate the little one – until he is willing to let go of what he thinks he knows. In kitchens it often involves peeling potatoes or chopping onions. Similar scenario, just more tears. Why? Because the person teaching is extremely happy to share her/his knowledge with keen students. Yet, the way to test anyone on their keenness to learn is to test their commitment to excellence in an easy field first. Do yourself a favour and order this book: ‘Don’t Try This At Home! Culinary Catastrophes from the World’s Greatest Chefs‘ by Kimberley Witherspoon and Andrew Friedman! In there you will find a story of a young New York chef who had recently found herself a job at a Seattle restaurant. Her boss was a Master in French patisserie (correct me if I’m wrong!) and she was keen to be taught by him. Yet he refused to teach her his craft until she took sweeping the kitchen floors seriously. For how could he teach her excellence in a craft that required a very high skill level if she showed NO excellence whatsoever at a task that required no skills?!!! So it is often at the bottom we start in any new craft. It is a test of our commitment to completion (Excellence). Once the Master sees that the student is willing to do what it takes to learn, then the next door opens. It is a rite of passage of some sort. Think of it! It will have taken any Master in their field long years of practice, often disastrous mistakes, hard learning to accomplish their level of game – and they are still learning! Would you be spilling out all your hard-learned experience to that school kid, trying to lecture you with incorrect facts? Hell No! You are looking for an empty glass and a willing mind who treasures your wisdom. At this point the real apprenticeship starts. The terms will be clear. How long, how often, how much – most apprenticeships are free B.T.W. (but that’s another blog post :-)). Just know, Wisdom/Teaching is always a GIFT, regardless the price or fee. Prove yourself to be worthy of receiving it! I had a Master of mechanical engineering at the IWF of the TU Berlin, Reinhard Preiss, who took a long time to open his heart, but once I was in, I was considered family. We had a great relationship! I still look up to his level of excellence and attention to detail! Yet, our relationship was enriched by a great human interaction, a trust that had developed by me being diligent under his cautious eyes. I had earned it. Now it is on the student to be a ‘sponge’, an ’empty vessel’, to absorb as much of the Master’s experience, knowledge and wisdom as possible. This is often not done by lecturing, but by working alongside each other, by sharing the space, solving a task together. It is the VIBRATION of Excellence that is taught! 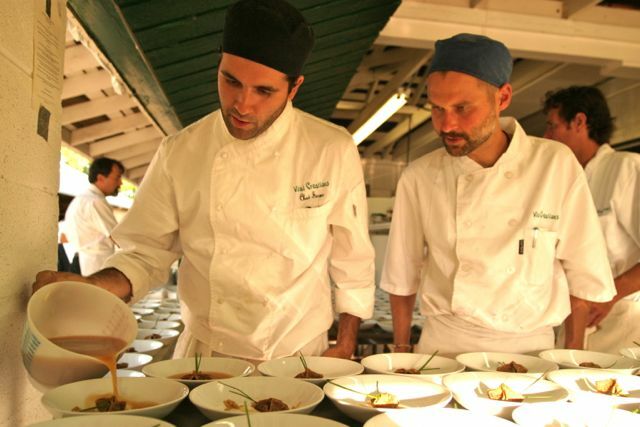 Now, since we are on a culinary playing field… What does it take to work with a master here? Travel! Volunteer! Work with the people who have gone before you! Approach them in a humble manner and ask if you can be of service and help them! Bring your own sharp knives and know how to use them. Again, this does not have to cost you more than your travel and accommodation. That’s how I studied and worked with Chad Sarno from 2002-2005. 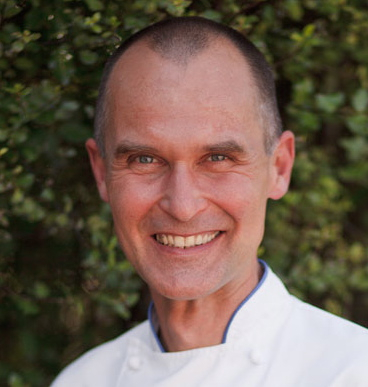 If you come to an accomplished chef to learn new recipes you are wasting your time. Get yourself a recipe book and start playing! When you are with them you will learn a new way of being with food. That’s what is taught! 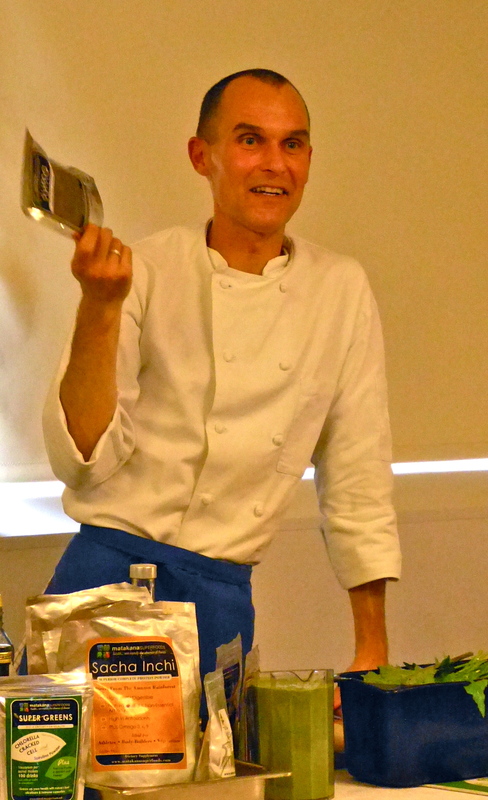 When back in your own kitchen you are now Consciously Competent and will have to PRACTICE, PLAY, CREATE and TEACH! Nothing will shortcut your 10000 hours to mastery and Unconscious Competence but doing it (read ‘Outliers, The Story of Success’ by Malcolm Gladwell!)! “Are you willing to be bad for long enough to become good?” – Are you??? Just don’t rock up at a Master’s door not practicing in your own life what you came to learn here! Takeaways are just not an option when you want to become a chef. Sorry! Work your field! Every day! Be in the kitchen, cater, teach, invite your friends for dinner! Again: 10000 hours. In the traditional way of how a craft was passed on in the guilds of Europe an apprentice, once considered being skilled enough to have finished his/her apprenticeship, was given a task to prove his/her skill level (Gesellenstueck). Passing the test they were now considered a skilled worker (again the concept of Conscious Competence). To achieve the title of ‘Master’ in that tradition requires to complete an even more complex task, to prove all one’s skills: the Master Piece. Does that resonate? It has been on my heart for a while. I trust it will be understood on a heart level too. What I have written here applies not so much to individual classes and workshops I offer, yet to the craft of ‘Culinary Arts and Education’. Should you consider to attend my Raw Chef Trainings to further your education I will however appreciate your understanding of the above. Ever been suspicious of what these supermarket breakfast cereals contain? Often less nutrition than the cardboard boxes they come in. Don’t be afraid to substitute or add other nuts and seeds like pumpkin seeds, coconut chips or brazil nuts. Just adjust the amount of date paste to obtain the desired sweetness. 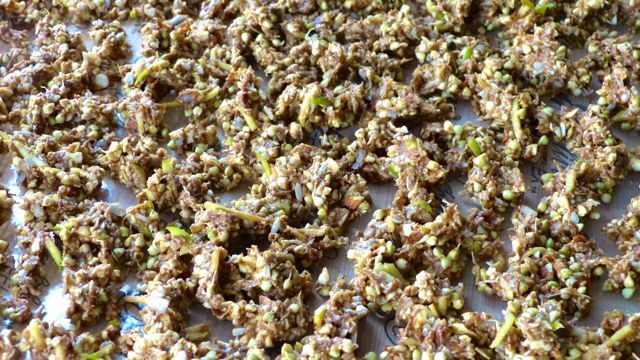 I often use sprouted buckwheat for this recipe as it is a reasonably priced alternative to lot of highly priced nuts, like pecans or walnuts. Buckwheat also dehydrates beautifully into a crispy crunch. I believe the thick ‘slimy’ run-off from the sprouting grains also helps to bind the granola clusters together – similarly to what happens with flax and chia seeds when you soak them. This brings us to another great little secret wit this recipe. By soaking and sprouting the nuts and seeds and then mixing the wet ingredients with date paste, apples and whatever spices and superfood powders you want to add, you achieve a natural clustered crunchy granola after dehydration. Adding wet and dry ingredients to nuts and seeds before dehydration and then dry the lot together in clusters, bars or any shape, will nicely attach the flavours and hold all other components together. 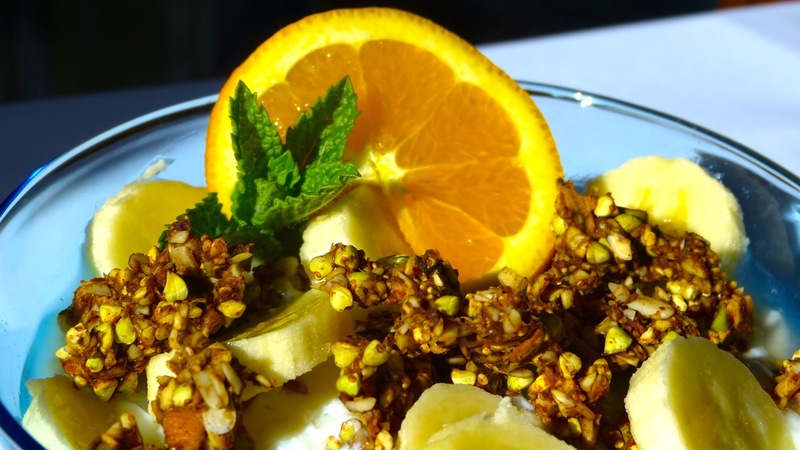 Now just pop your granola clusters into a bowl, add some banana slices and pour your freshly made almond milk or raw organic Jersey cow’s cream over it and enjoy! You are still waiting for the actual recipe, right?! Keep the sprouted buckwheat aside. Using the food processor, pulse all other nuts and seeds until coarsely ground. Add in a large bowl to the sprouted buckwheat. Also using the food processor blend the dates with a small amount of water until it becomes a smooth paste. Dry dates will require soaking over night. Toss the paste along with the diced apples, chia seeds, maca powder, cinnamon, vanilla extract and salt with the nut mixture. Hand mix well. Adjust flavour with lemon juice. 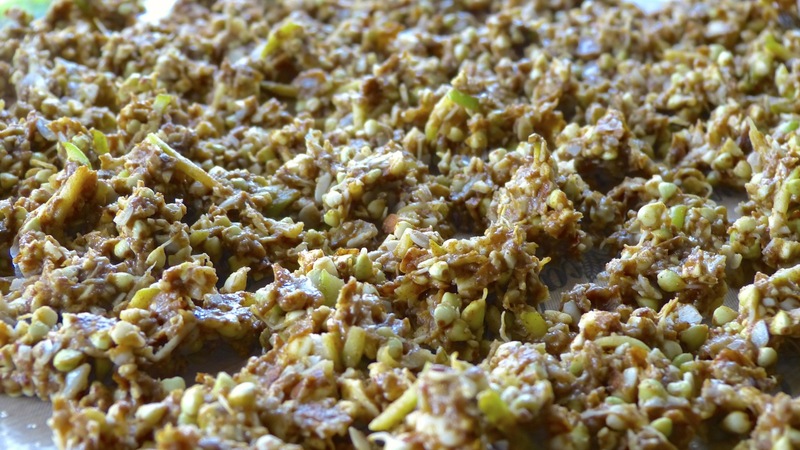 Continue by crumbling the ‘wet’ granola onto Teflex dehydrator sheets and dehydrate at 145 F for 2 hours. Over the next hours turn the temperature gradually down to 115 F. Turn trays periodically. After 6-8hours flip over and remove Teflex sheets. Dehydrate at 105 F for 12 more hours or until crisp. This process is important to stop the granola from fermenting during the dehydration process. Not that it would be bad for you, yet the flavour would be slightly different 😉 It would definitely clear up any phytic acid remnants after the soaking and sprouting. Notice the space between the clusters when wet! Store in sealed glass jars. 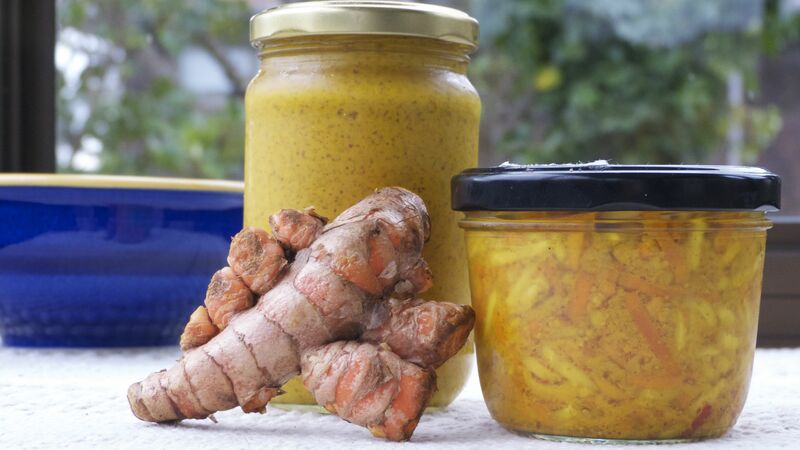 Fresh Turmeric Pickle Recipe – Immune boosting Superfood! 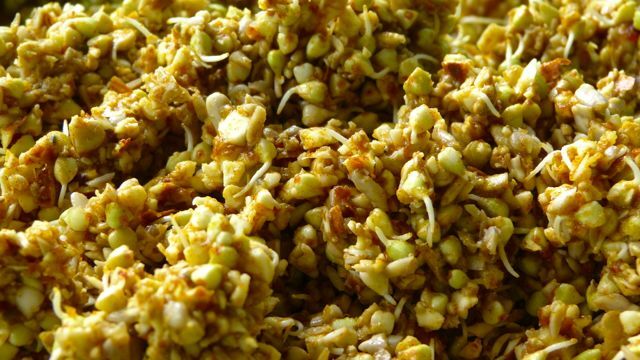 Here is a true Superfood in a delicious recipe. Ramesh at the Takapuna Market, every Sunday morning just laughs when I buy his whole stock of fresh turmeric for the day. 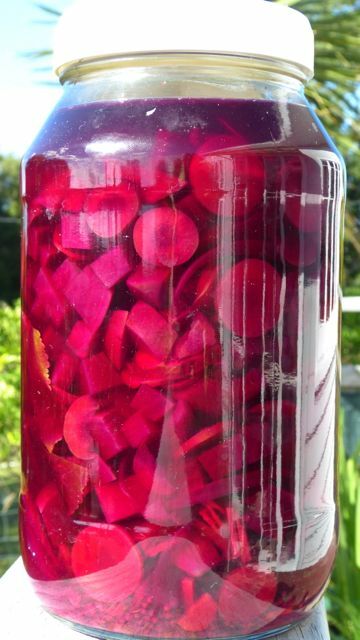 My Sunday afternoon is then usually spent making this yummy condiment, packed with anti-oxidants and immune boosting properties. I found this recipe a while ago online, posted by a lovely Indian lady as one of her specific culture’s traditional dishes. Her recipe was with ‘hing’. I took the freedom to exchange it for garlic. Enjoy! Multiply this recipe for a larger number of jars!!! Roast Fenugreek and mustard seeds in a skillet until they develop an aromatic smell. (I know, this is leaving the realm of raw foods – for a most fragrant reward :-)) Cool and powder in spice grinder or blender. In a large bowl mix everything together by hand. Fill into sterilized jars and cover with oil. Let sit for a week to blend flavours well. Will keep refrigerated for several months. Note: An alternative process is to blend everything into a paste (left jar in picture). However, the chunky pickle is more refreshing as a side dish (right jar in picture). 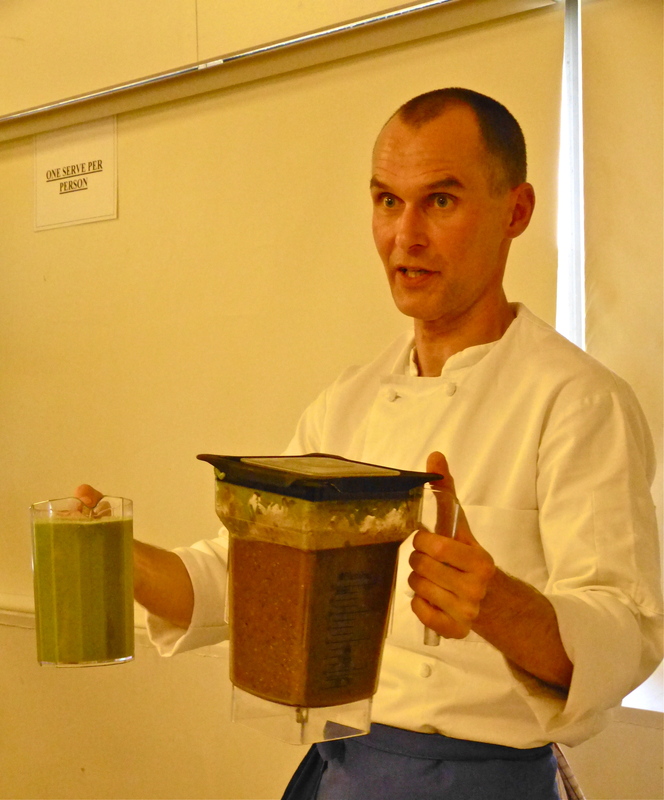 Yes, for all of you who now got curious about the Sunday Smoothie Demo at the Green Living Show. Here it comes. It is based on the basic Green Smoothie Recipe I posted here earlier – just loaded with potent Superfoods. 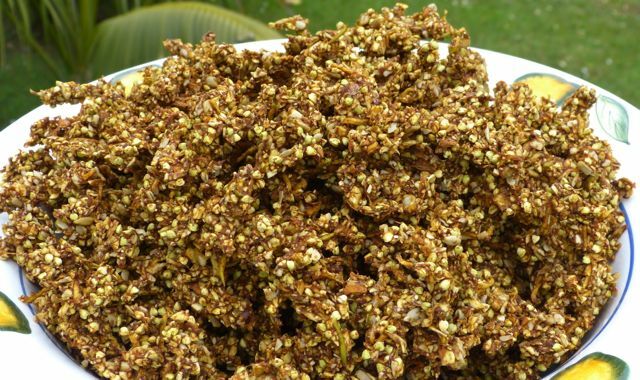 To find out more about any of the ones suggested in this recipe, you can visit either Navitas Naturals‘ website or the genuine New Zealand based Matakana Superfoods one. Fresh Fijian turmeric can be obtained from Ramesh and Jayshree on Sunday mornings at the South East corner of the Takapuna Market. Start with the juicy fruit in the bottom of the blender and finish with the chopped dandelion leaves on the top. Then pour water in so it reaches about 2/3 up in the blender jar. Blend on high until everything is smoothly blended. Split in two and share with your loved One! Here is the much requested recipe for the Raw Chocolate Super Fudge I demo-ed last Saturday at the Green Living Show in Auckland. In a large bowl hand mix everything thoroughly together. Line a standard baking tray with baking paper. Press the mass evenly into the tray and level the surface with a cranked metal spatula. Set aside for minimum of one hour to set. Cut into 64 or 128 smaller pieces. Serve as is or place in dehydrator for a few hours at 115°F until dry to the touch. Below a thorough description of how we grow wheatgrass without fuss and mess in planting pot trays in our house. 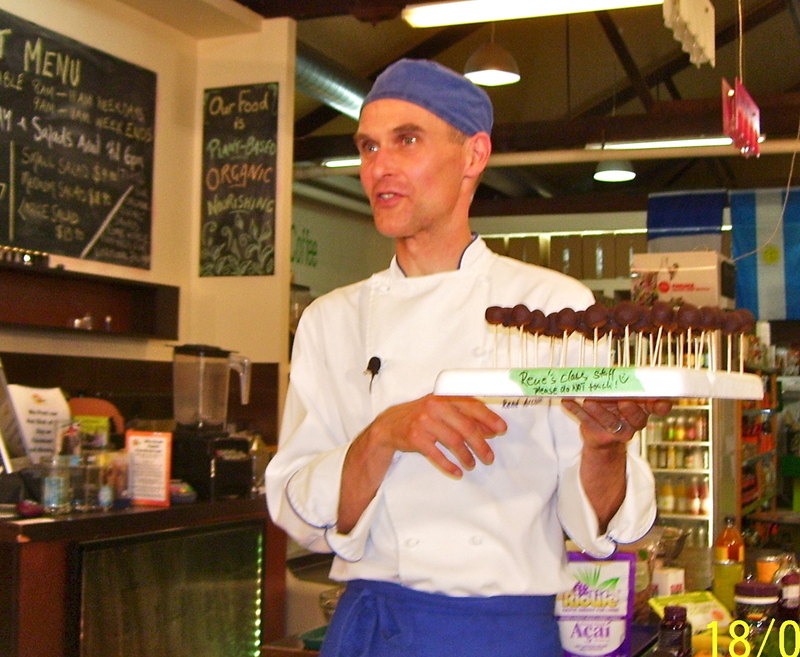 Let me just quickly announce our upcoming ‘Sprouting and Wheatgrass’ demo class on Wednesday, May 9th, 2012, from 7-9.30pm at the Wise Cicada in Newmarket, Auckland, New Zealand. How to grow different sprouts and micro greens both in jars and on soil. 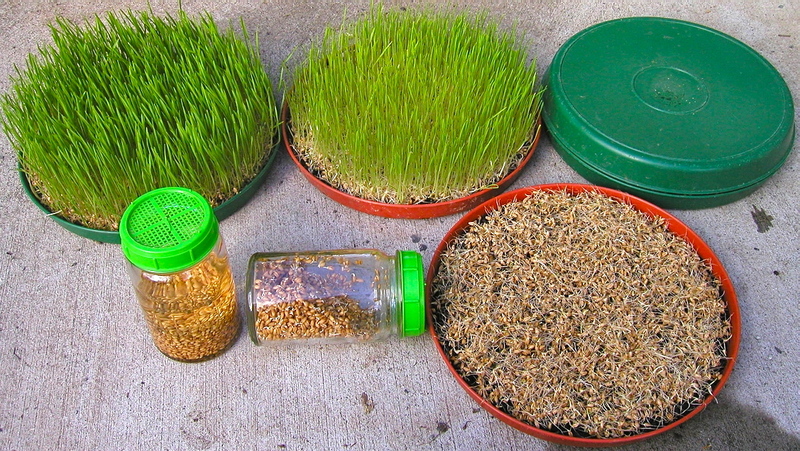 How to most effectively grow your own wheatgrass and juice it. 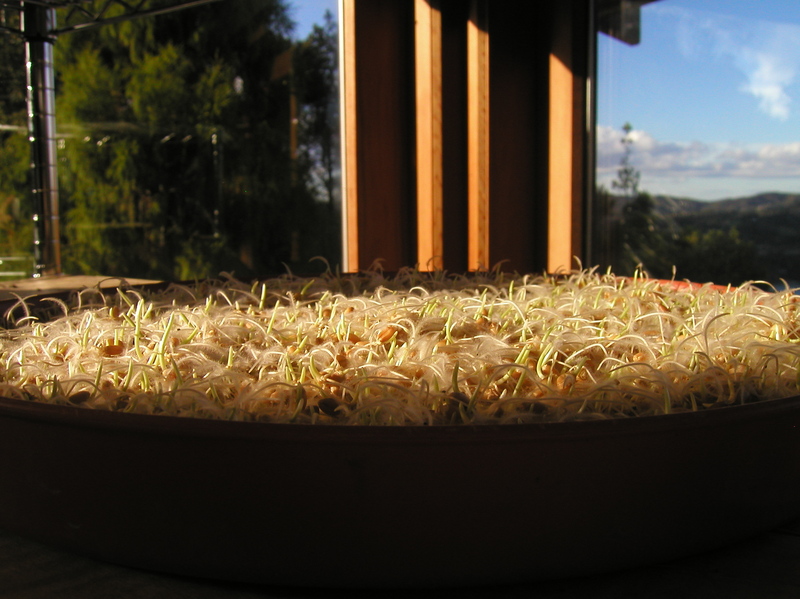 What benefits do different sprouts and micro greens offer you. Your investment only: NZD60 – just click the PayPal button below to book your seat. Full recipe booklet and samples included. You will learn how to confidently grow different kinds of sprouts year round and how to maximize the yield of your efforts. Approx. 1.5l organic compost soil, make sure it is sterilised (as most of the stuff you buy in bags from garden centers is) to avoid weeds and undesired micro organisms. Place wheat berries in jar and fill jar ¾ with water. Cover opening with sprouting lid or mesh cloth and rubber band. Leave to soak overnight. Drain the water and rinse the wheat berries a few times until water runs clear. Place jar on an angle with the opening facing down so the remaining water can drain. Make sure the jar is not exposed to direct sunlight as it can get too hot for the sprouting grains. Rinse once more in the evening and put back again to drain. Rinse the now slightly sprouted grains and put jar back to keep them sprouting. Once the wheat berries have developed small shoots and fine hairy roots it’s time to plant them. Fill one of the trays evenly with organic compost soil, approx. 2cm high. Carefully spread the sprouted wheat evenly over the whole soil-filled tray. Water the tray evenly with not more than 1 cup (250ml) filtered water. Cover the planted tray with the second one (upside down) and place in a warm (room temperature) spot out of direct sunlight. The young plants have now probably grown strong muscles and lifted the lid. Take it off and place the tray with the young plants in a well ventilated and lit spot out of direct sun light. Water evenly with approx. 0.5l filtered water. Water the young grass when the soil is getting dry. When the greens are long enough and the roots have grown into a solid system, holding the soil together, you can carefully grab a fist full of greens close to the edge and lift the whole pad on one side. Now pour the water into the tray under the lifted roots. Do this equally all around the tray to make sure all plants get watered. Watering the grass this way keeps the space between the greens relatively dry which prevents mould from growing. The plants will now tolerate a few hours daily of direct sunlight to develop their dark green colour. Once the greens have reached 10-15cm in heights you can start harvesting them. The optimum harvesting time is just before each individual plant brings out its second leave. At this stage the wheatgrass has its highest nutrient content. However, you can still use it afterwards. To harvest the grass, use a sharp 20cm long chef’s knife. Starting at the outer edge of the tray, grab a fistful of greens and cut them about 1cm above the soil, avoiding any mouldy spots. Depending on the heights of the grass and its moisture content, a quarter tray of grass yields approx. 40ml of wheatgrass juice. Put the greens in your hand directly into your wheatgrass or Greenstar juicer. Should you not own such a juicer, you can cut the harvested greens in approx. 0.5cm long pieces and put them into a blender. Add 0.5l filtered water and blend at highest speed until the greens are completely dissolved. Now pour the blender content through a cotton cloth into a bowl or jar. Squeeze out all the juice by tightly squeezing the cotton cloth. Wheatgrass juice is best consumed fresh as the delicate active ingredients oxidise very easily. Keep the juice in your mouth and squish it around for 2-5 minutes. That allows the absorption to begin through your mucus membranes in your mouth and under your tongue. To mellow the very strong ‘green’ taste try juicing carrots, apples, lemon and ginger with the wheatgrass. 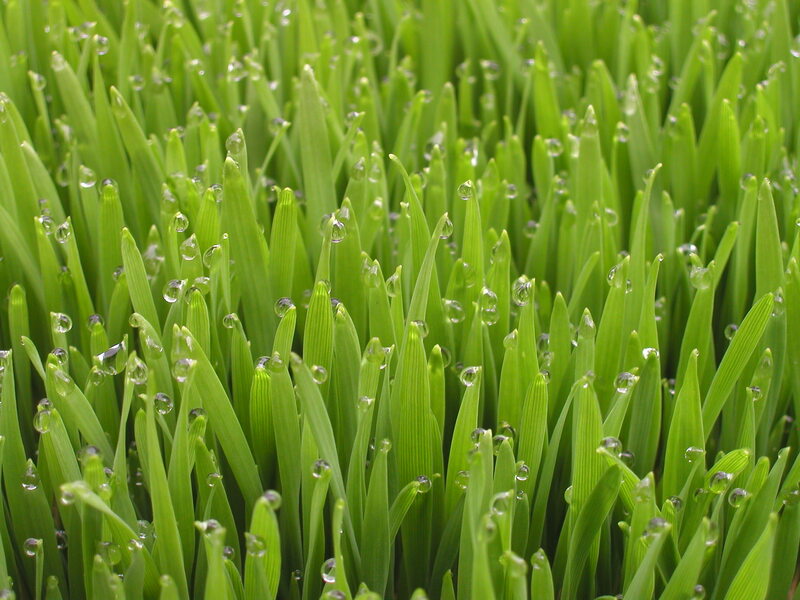 When you start to take wheatgrass juice, begin with 30ml full strength juice per day. You can increase the amount or frequency day by day. Juice you make with a blender is not as strong as the one made with a juicer. That means, you can take more of it. Dr. Gabriel Cousens recommends the use of wheatgrass juice for enema’s too. Please refer to his books: Rainbow Green Life Food Cuisine. Anne Wigmore’s books are another great resource on the topic of wheatgrass and its many uses. To juice a whole tray of wheatgrass daily you also need to start a new jar of wheat berries a day. For a continuous process you will require 4 jars with mesh cloths and 8 big flower pot trays as well as a steady supply of sterilised organic compost soil. The harvested root mats with soil can be put upside down directly into the garden or the garden compost. See you on Wednesday, May 9th, 7-9.30pm at the Wise Cicada. Spaces are limited and bookings essential! So book yours by clicking the PayPal button below! Best regards and see you on Wednesday! Join us for our next journey into the mysterious realm of Superfoods. We are talking – in my humble opinion – about foods with high nutrient content and density that may positively affect our wellbeing, health and performance. Walking through any well stocked health food store, you will recognise them by their unusual names (at least in our Western understanding) and also their intriguingly high price tags – compared to the standard fare, we have become so used to. Many of these foods are sourced from pristine environments like the Himalayan mountains (Goji berries) and the Amazon rainforest – hence their ‘unusual’ names. These plants and their fruits and roots are oftentimes not farmed but wild-harvested which explains their high content in nutrients (non-depleted soils) and also the higher price compared to other foods. Foods in this category are Goji berries, Acai, Maca, Noni, Maqui, Suma, Sacha Inchi, Camu Camu, Chia seeds and many more. 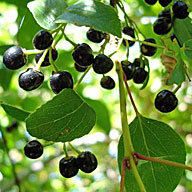 Many of these are supplied and distributed by companies like Matakana Superfoods. On their website you will also find much detailed information about the different Superfood products. Among the more ‘common’ superfoods are blueberries, young coconuts, apple cider vinegar, cacao, turmeric, green tea, wheatgrass, sprouts etc. 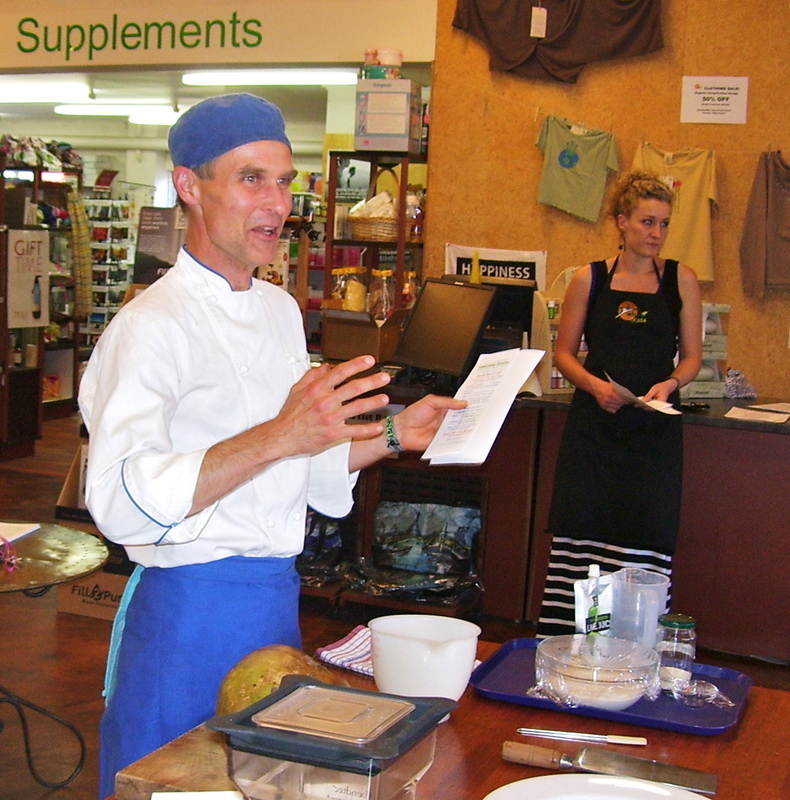 And yes, we are offering you another class around these preciously packed nutrient-rich foods. Exploring the ones we have not touched on in our last class on the subject, Superfoods 101. 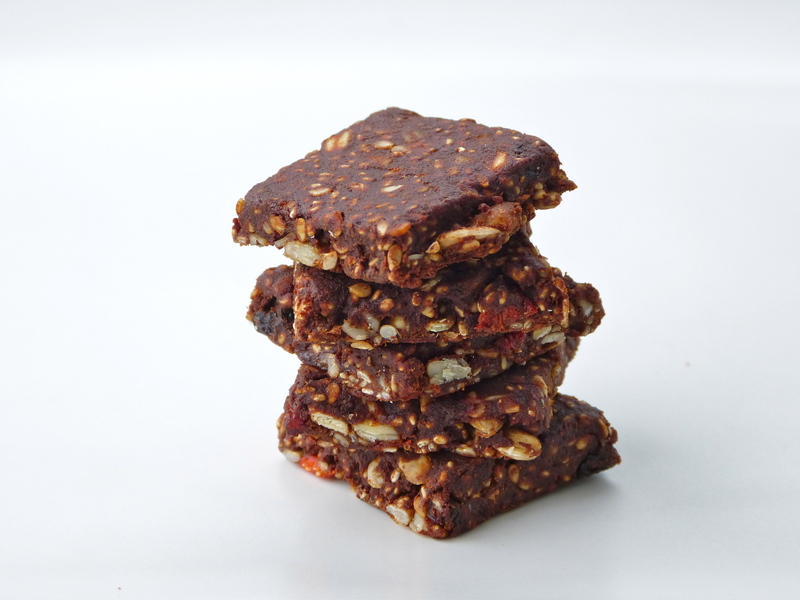 To name a few: Maqui, Yum, Mangosteen as well as some old friends like Maca and Cacao. including all samples and the complete recipe booklet of the class. This class will be centered around a systematic approach to using Superfoods in you daily diet. What (powder, berries) can you incorporate where (your green smoothie, almond milk) and how – for maximum benefit to your wellbeing, health and performance. With a bit of good luck we will have Kevin from Matakana Superfoods with us to introduce a few of his products and to answer your questions about the different power foods. Seats are limited to 20 students. Book your space today! 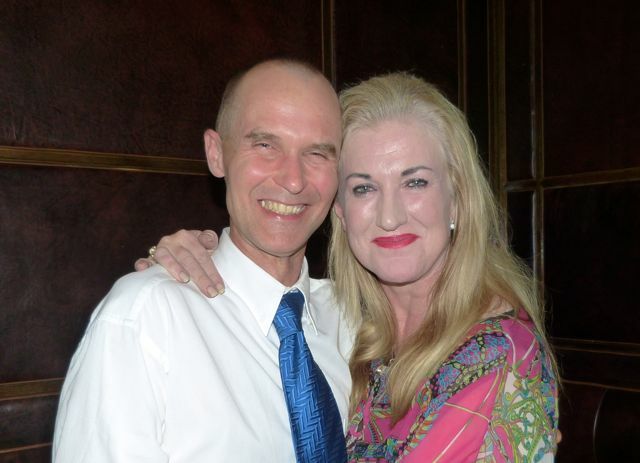 Ring René to book on: 027 555 1622 or contact us here. Alternatively go right ahead and confirm your booking by paying the course fee through our PayPal portal by clicking on the button below. Looking forward to seeing you on Tuesday! PS: We still have room at New Zealand’s first hands-on Raw Chef Training, Level 1. I have extended the Early Bird rate till Monday, April 30, 2012. Book your space Now! Believe it! 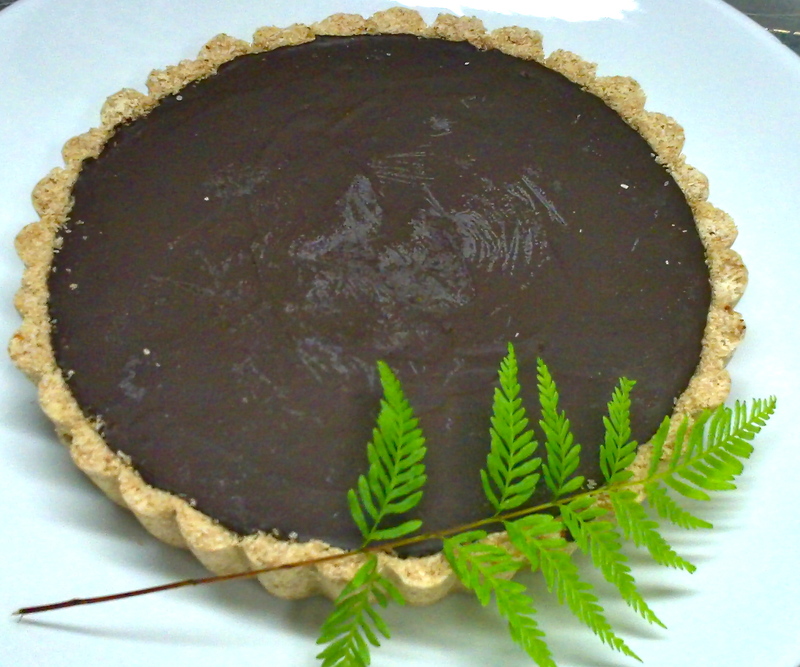 We are announcing a raw chocolate class. This will be the ultimate in making delectable desserts, snacks, cakes and presents using raw cacao in all its various guises – right on time for Easter. 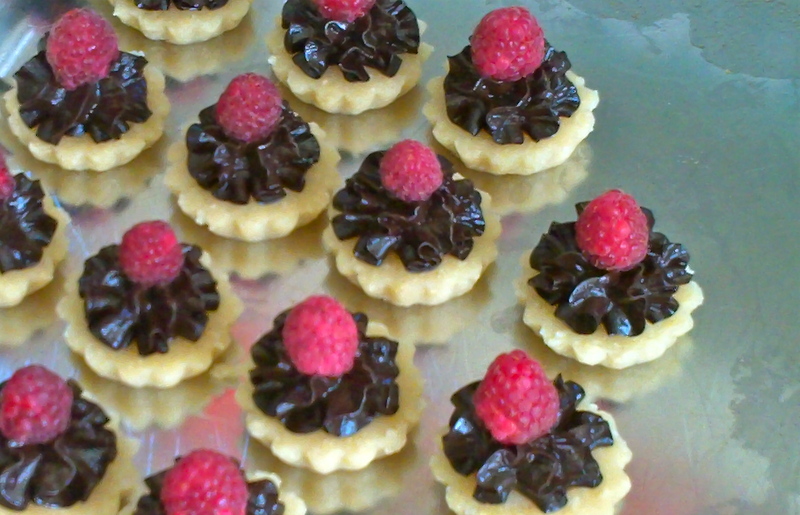 How to make a variety of simple, yet stunning chocolate cakes, cookies, drinks and desserts. How to make delicious shakes, using raw cacao and other superfoods. How to entertain friends and family with your own sweet chocolate treats, pralines and chocolate bars. 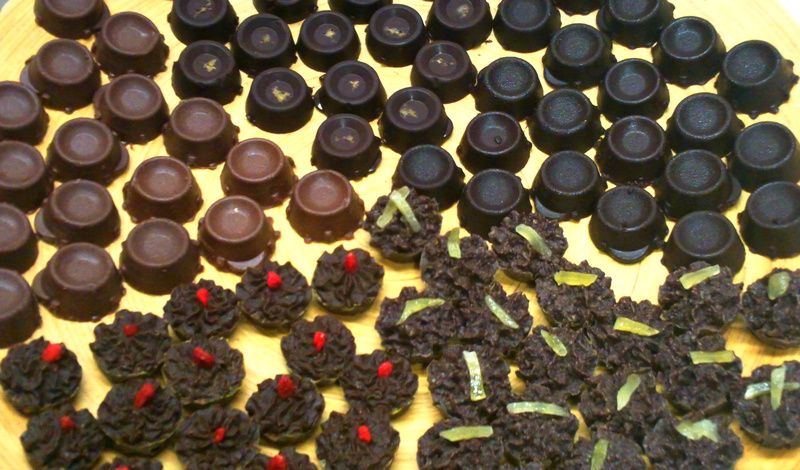 Which flavours enhance or combine well with chocolate. What ratios are required for a rounded flavour and also consistency. What secret ingredients will make any of your creations a hit with your audience. As always, a complete recipe booklet and samples are included. Space is limited to 20 people. Book yours today by ringing René on 0275551622 or contacting us here. Oh, upon frequent request at our previous classes we will actually have some of the presented sweets for sale after the class. Bring your piggy bank! 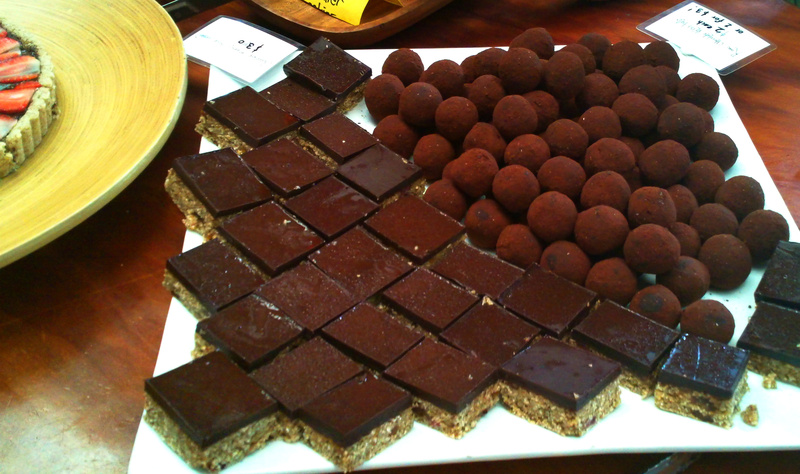 These ones were the hit at the Prana New Year Festival 2012 ‘Chocolate Bar’ at the Barn. Having arrived here you might have been looking around on the web for a decent Bliss Ball recipe that didn’t just sport some nuts and dates rolled into a ball. I’ve been in your position and couldn’t find any either that deserved the ‘Bliss’ with the Balls. A lunchbox treat for Super Heroes! Combine the coconut, cashew flour, chia seeds, maca powder, 3 T of raw cacao powder and the cacao nibs in a large mixing bowl. In a food processor pulse the goji berries then add to the date paste. Now add the moist ingredients, incl. Vanilla extract, to the dry mix in the bowl. With your hands mix everything well. With a 1 T measuring spoon scoop even amounts of bliss ball mix into your hand and roll into evenly round balls. Dust each ball individually by loosely rolling it in raw cacao powder in a separate bowl. Let it gently roll around in your hand to apply the cacao powder firmly to it and to shake off any excess powder. Refrigerate for 1 hour then place on a platter and serve – or hide in the Super Hero’s lunch box. Enjoy, and try keeping up with the demand!